Ford kicks off Fiesta marketing campaign, "It’s a pretty big deal"
Actually, the Ford Fiesta marketing campaign started well over a year ago with the Fiesta Movement social media effort. The primary advertising campaign is now moving into the more traditional print and broadcast areas as well as a new phase of the “Movement.” The first 60-second TV ad will air Tuesday night during American Idol and then spread to movie theaters to lead in the big summer blockbusters. The more interesting aspect of the campaign will be the online webisodes that feature Fiesta Movement agents in short films. What’s not to like about zombies and key fobs to advertise a hip new car? Another webisode may be a play on last year’s Fiesta vs. Corvette comparison on Top Gear with the little Ford facing off against a Lamborghini this time. 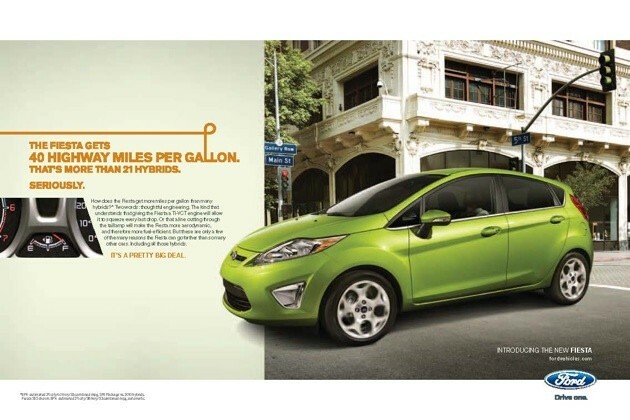 The tag-line of the campaign will be “It’s a pretty big deal” referring to all of the features and equipment that are either standard or available in the Fiesta including the seven airbags, push-button start, heated leather seats, SYNC and especially the 40 mpg highway fuel economy. Ford is heavily promoting this as a premium small car rather than just a cheap, small car. One of the print ads features a comparison of the air bag count as compared to the BMW 3 series. In spite of that premium feel, Ford is still promoting value although not necessarily the way they have in the past with a low-ball entry level price. Instead, the hatchback Fiesta, which starts at just over $15,700, is being pitched against the Honda Fit Sport. With down-sizers, urban dwellers and younger buyers being the primary target market a big part of the campaign will also involve ad buys on urban and adult contemporary radio stations as cable channels like BET.